Click here to check out a video on "Rome Reports." 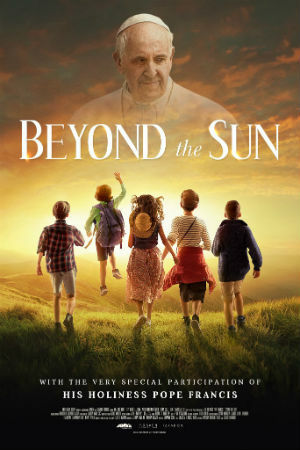 You only need to view the first 12 seconds wherein they actually admit the Pope is going play a part in an up and coming movie called "Beyond the Sun." And yes, the inference to Sun worship is always to be expected when it comes to Pagan Rome. What amazes me is how blind the Popes of Rome truly are when it comes to Biblical as well as common sense. Absolutely everyone knows the first sin ever to be used by Satan was that he lied to one third of Heaven and conned all those angels to join him in a rebellion wherein hellfire is the end result for him, his angels, and every foolish human on the planet that cannot see the evidence of a Creator and omnipotent God everywhere they look. As we know, lying is the native tongue of Satan. In fact, the Author of Truth, Jesus Christ stated the following when confronted by the Pharisees 2000 years ago. He said, "Why do ye not understand my speech? even because ye cannot hear my word. Ye are of your father the devil, and the lusts of your father ye will do. He was a murderer from the beginning, and abode not in the truth, because there is no truth in him. When he speaketh a lie, he speaketh of his own: for he is a liar, and the father of it." -John 8:43-44. And so why is it this Pope and every Pope before him always seem to keep missing basic biblical reality of how any form of lying is in fact a sin? And why does this Pope uses lies to declare God creates people as homosexuals, who along with the last three Popes has openly lied to declare in writing that evolution is scientifically sound, and worst of all lies, all these Popes have declare Jesus is not needed for salvation in writing, it's because this Pope and every Pope before him have been identified by the God of creation to be Antichrist. Absolutely every prophecy that has ever been uttered in the Word of the eternal God have all been confirmed in historic record to have been fulfilled by the Popes of the Roman Catholic church. Not a few prophecies, not 90% and not even 99%. 100% of every prophecy about Antichrist is found fulfilled by the Popes. And yes, I am fully aware that the Pope, who is also a Jesuit that has taken a vow to lie to every Christian he meets in writing, is "playing himself" in the movie. But common sense dictates that he will still have to act as if all that surrounds the scene he is in at the time is actually reality if he's to pull his acting debut off. But anyone with common sense knows it is not reality. He is acting a part. It's a movie. And, just being in that film alone openly declares he is preaching to all of his flock that it is perfectly acceptable for each and every one of them to emulate the character of Satan who is the father of lies.